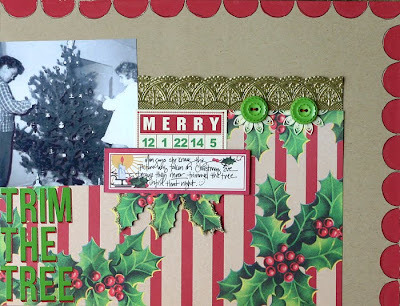 jbs inspiration: Christmas in July! Today we thought we would get in the Christmas spirit with some of our CHA projects. These first few are from Jenni Bowlin! This one is a charming heritage photo done with the NEW Holly Stripe and Green/Red Shadow Alpha Stickers. Lovely classic Jenni detailing here. The journaling is on a label off the NEW Christmas 2011 Accessory Sheet layered over one of our Mini Christmas Bingo Cards. 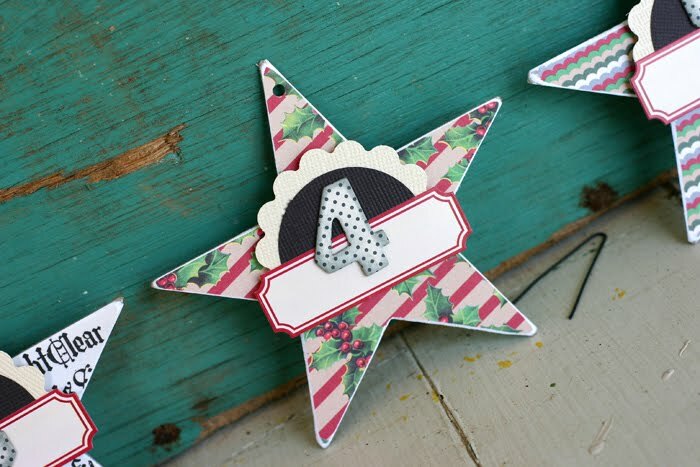 Jenni cut out a piece of the holly berry and edged it with glitter for a bit of bling to match the German foil. 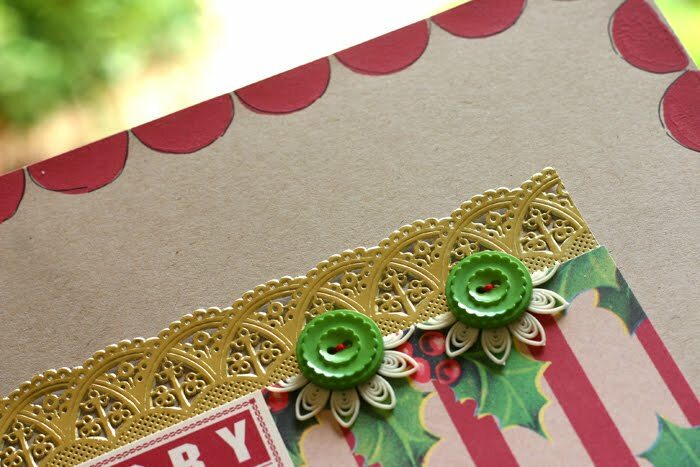 Also notice how nicely the NEW Doily Flowers layer under the Green Vintage Style Sew-On buttons. And here the NEW Scalloped Foam Stamp has been added around the edges using a Cough Syrup Paint Dabber. Jenni edged this with a black pen for added detailing. Super cute advent ornaments made from the NEW Christmas 2011 Mini Pattern Sheet and Alterable Chipboard Numbers. Here is a close up shot of one of those where you can see Jenni has lightly edged the numbers with our NEW Weather Vane Ink. And here is a bit more from Jenni with mixing the old with the new . 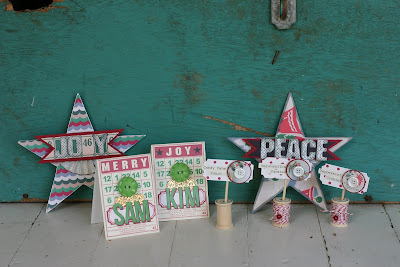 . . Christmas decorations featuring the new release with the Christmas Mini Bingo Place Cards, Vintage Christmas Chipboard Buttons, Chipboard Stars, and Vintage Style Wooden Spools. And now a couple from Doris Sander. A layout with a JBS Core'dinations Cardstock background and Lottery Card from the back of the Holly Stripe paper featuring prominantly. 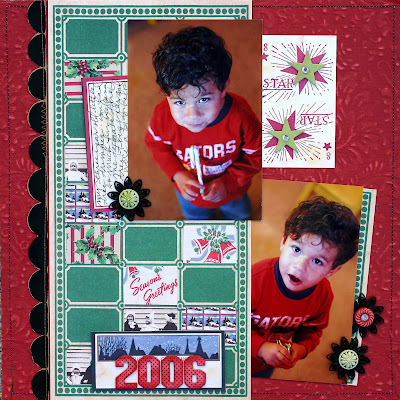 Bits from the Mini Pattern Sheet were added for a fun patchwork look. 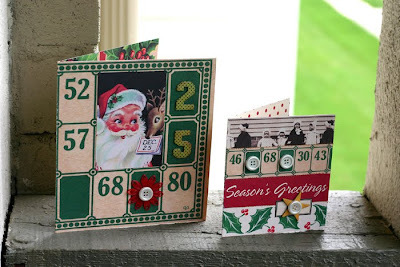 The title is done in more of the NEW Alterable Chipboard Numbers. This time the numbers are inked more thoroughly with Cough Syrup Ink. 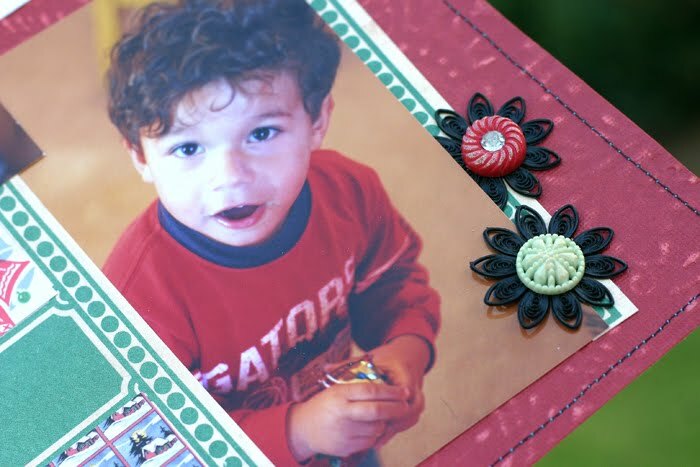 This layout also has the NEW Scalloped Foam Stamp, this time stamped in Fountain Pen Paint onto kraft cardstock and trimmed out before being adhered to the page with some machine stitching. You'll see one of our new sweet Delicate Brads. This one is green and altered with a hint of Malted Milk Dabber. And here you see another delicate brad. this one was white and has been altered with a Stick Candy Dabber. The NEW Rhinestone brad has also been altered with a bit of Malted Milk which helps the texture show to its advantage. And for all you cardmakers out there, you are going to find Vintage Christmas Holidays a dream to work with for Christmas Cards this year! Amazing Mini Tutorial by Betsy Sammarco! August Exclusive Stamp in Action! 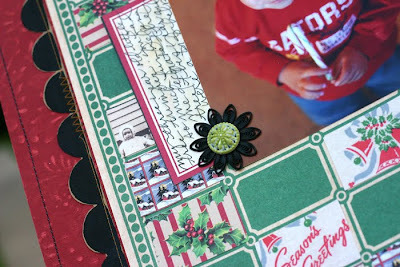 NEW Jenni Bowlin for Ranger Colors in Action! 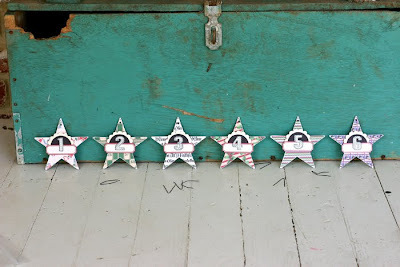 (Belated) JBS Mercantile July Updates! Summer Camp with Becky Novacek! July Mid-Month Offerings at JBS Mercantile! CHA Summer 2011 Alphas! + a Giveaway! Farewell Danielle . . .
CHA Summer 2011 BRADS! + a giveaway! Got Vacation Photos? Get 'Em All On One Layout! 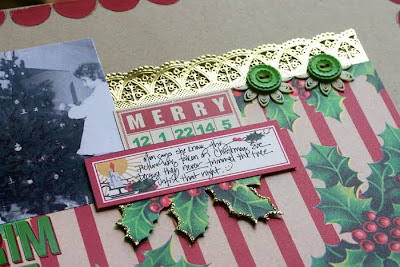 CHA Summer 2011Vintage Holidays + a Giveaway! Guest Star Erin Terrell Clarkson! Welcome to the JBS Team Mindy Miller! Welcome to the JBS Team Briana Johnson!